From BBQ Baby Back Ribs and Pulled Pork Sandwiches to the Combo Platter you know and love, this State Street staple continues the award-winning tradition it kicked off in 1976 – providing “The Finest” in food and service to Milwaukee and the surrounding areas year-round. Simplify your entertaining with full-service event planning and the delicious flair for food you can depend on from Saz’s Hospitality Group. Tailgates and Picnics? A natural fit, of course. But Saz’s expertise runs the gamut – from corporate lunch meetings for 25 to elegant six-course fundraising galas for 500, Saz’s Catering ensures complete event success. Housed within the picturesque Western Lakes Golf Club (home to a championship 18-Hole course and other amenities), this Lake Country location offers not only exclusive catering services for all events at Western Lakes, but also top-notch corporate, social, and wedding off-premise catering throughout the area. Exceptional service and culinary perfection blend seamlessly together at the hands of Sazama’s staff. Sazama’s serves as the exclusive caterer of the Marcus Center for the Performing Arts, planning high-profile events from the first course through the delicious finale with polish and finesse. Currently offering a product line of four unique BBQ sauce flavors, four frozen festival-favorite snack items and its signature BBQ baby back ribs, Saz’s now appears on the shelves of over 200 local area retailers as well as online in response to the demand of Saz’s fans. Have you been to the Wisconsin State Fair or Summerfest? You’ve likely tasted (and perhaps occasionally crave) Saz’s classics. With Mozzarella Marinara, Sour Cream & Chive Fries, and Natural Wisconsin Cheddar Cheese Curds teaming up in the festival-favorite sampler combo, it’s always a Saz’s Summer at the fair. This year, find Saz’s at over 20 festivals from May through October. Join us for a spectacular Saz's Mother's Day Brunch Sunday, May 12th, 2019 at Saz's State House or Western Lakes Golf Club! 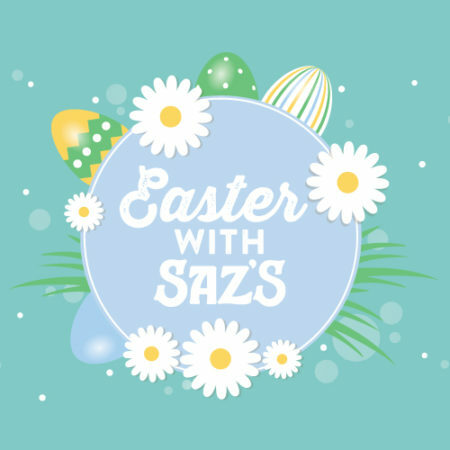 Celebrate Easter and the beauty of springtime with Saz's Hospitality Group. On Easter Sunday, we're offering three unique brunches at three distinct locations, including Saz's State House, the Marcus Performing Arts Center, and Western Lakes Golf Club. SHG is hosting upcoming Saturday job fairs for part-time and full-time summer employment across all SHG companies. Join our team!